We cover all of these miter saws and much more. The best miter saw depends on a lot of factors but we’ve put together a guide that will help you decide which miter saw (also known as drop saw) is best for your specific needs (and budget). Carrying out DIY projects at home isn’t what it used to be. Thanks to amazing tutorials on the internet, it’s now possible for the average person to do practically anything. Don’t forget, another big reason why this is all possible is due to the amazing tools we now have at our fingertips. Do you remember sweating for hours with a basic saw trying to do something special? Even then the end result always left a lot to be desired, but if you have the best miter saw available it couldn’t be more different. They will even make a contractor’s dreams come true, and we’re going to dig a little deeper to find out why. A cross cut is the most basic cut you’ll see. When the blade from the miter saw drops down it will be at exactly 90 degrees, so you’ll be left with a perfectly straight cut. A miter cut is one in which you’re cutting along the width of the wood, so the blade will still drop down vertically except you won’t be left with a straight edge from side to side. A bevel cut can only be produced by taking your blade and tilting it at a specific angle. Instead of cutting along the width of your wood, this time you’ll be cutting against the thickness of it in a diagonal direction. A compound cut is the most advanced of them all, and it’s almost impossible to carry out effectively without the best miter saw. It combines both the miter and bevel cut together, so you’ll be left with two different angled cuts. If you’re new to using a miter saw then take a few minutes to watch this helpful video that covers the basic cuts. This usually won’t be considered the best miter saw because it lives up to its name. Although it does have its benefits, it’s as basic as they come. If you purchase a basic miter saw the biggest drawback is the fact you’ll only be able to use it for a couple of cuts. Apart from your standard cross cut, the only other one you’ll be able to produce is the miter cut. This is because the blade on a basic model won’t be able to tilt, so it’s only the miter angle that can change. The miter angle usually swings 45 degrees in each direction from the 90 degree starting point. A good option for the average homeowner. The compound miter saw is almost perfect, because it will give you the ability to produce all of the cuts we’ve mentioned. Not only will the blade be able to pivot, but in most cases it can drop to give you an angle of 45 degrees. In theory, you could break the compound miter saw down into two different types. To keep it simple we’ve stuck with one because they’re both almost identical, but some models out there will be able to let the blade pivot in both directions. What matters most is that single and dual bevel compound miter saws deliver all cuts. Although it’s the best miter saw if we’re counting features, there isn’t too much to say about the sliding compound miter saw. There is only one major difference compared to the last one we looked at. The head will be able to slide backwards and forwards, which will allow you to work with wider pieces of wood (and some other materials). Miter saw blades usually only come in 10-inch or 12-inch diameters, so the sliding feature could come in very handy. It’s almost essential for contractors when you consider the vast amount of jobs they’ll come up against on a regular basis. One of the best 10″ miter saws you can buy. Excellent quality. Makita LS1016L : Can cut up to 6-5/8″” crown molding (vertically nested), 4-3/4″” baseboard (vertical), and 12″” crosscuts at 90°. The Makita LS1016L has the largest crown molding cutting capacity in its class. A lot of the advantages and disadvantages will depend on the specific model you buy, but there are a couple of major ones that will apply to the particular type of miter saw. We’ll take a quick look at them now before we move onto the main event. We’re also going to talk about the cordless compound miter saw in this section. It wasn’t mentioned before because its only difference is the fact it’s cordless, but that will come with its own unique pros and cons. Which One Is The Best Miter Saw For You? So far we’ve looked at all the different types of miter saws available, including the cuts they’ll be able to make. It was crucial to cover the basics so you understand how they work, but when you’re ready to find the best miter saw for your home there is a lot more you have to explore. Even different models produced by the same manufacturer will have special features to help them stand out, so let’s inspect some of the top ones available today. It’s also worth clicking on each one you like, because it will allow you to read invaluable reviews from current users. Lightest miter saw in its class at only 26.3 lbs. 15 Amp motor, intense power for the toughest cutting jobs. Hitachi’s exclusive Laser Marker System for increased cutting accuracy. 0-52 degree miter angle range, to the right and left for increased flexibility. Horizontal handle with soft, vibration reducing Elastomer grip adds comfort and control. Large pivoting fence with a 4” cutting capacity for crown molding applications. Large table, provides better material support. Thumb actuated positive stops, easy to use for quick miter adjustments. Dust collector attachment, to minimize airborne particles. Lightest in its class at only 26.3 lbs. Take it anywhere. Compatible with the UU610 (Extension Stop) and UU610CZ. ✓ View or download the MANUAL or the PARTS LIST for the Hitachi C10FCE2. The 15-Amp motor inside the Hitachi C10FCE2 allows the 10-inch blade to spin at speeds of up to 5,000 RPM, so it won’t have problems dealing with any wood you throw at it. To help you deal with the vibrations the handle has been specially designed to absorb them, while being very soft and comfortable to hold at the same time. The elastomer grip isn’t the only thing designed to make your life easier, because it also has a dust collector attachment to keep your work-space as clean as possible. The bag also keeps your miter saw clean, which will help to prolong its life because its internal components will last longer. You might have noticed this model is only a single bevel miter saw, and it has a 0-45 degree bevel range. Throughout the 45 degrees there are adjustable bevel stops to help you make the most accurate cuts possible. You also shouldn’t worry too much about the 10-inch blade, because it has a flip fence capable of raising up 4-inches for thicker wood. The miter angle range is where the Hitachi C10FCE2 shines. It can go from 0-52 degrees, which is usually more than you’ll ever need. You’ll notice a couple of miter stops along the bottom of the drop saw too. These are situated at popular preset positions allowing you work a lot faster if you don’t need to set it to random angles. You already know a single bevel miter saw doesn’t need to weigh as much, because when the blade only drops to one side it’s easier to hold steady. It’s still weird when you consider the entire miter saw only weighs a little over 26 pounds, which makes it one of the lightest and most portable in its category. Excellent miter saw for the money. Great value. Like all power tools it’s never going to last forever, but Hitachi are convinced it’s going to last at least 5 years. That is how long your professional warranty will last, so if there is an unexpected problem you’ll be covered. There are also a few upgrades you can purchase too, including a model with laser marking built in to make your cuts deadly accurate. Professional quality. Durable stainless steel miter detent plate with cam lock. Integrated CUTLINE Blade Positioning System provides adjustment free cut line indication for better accuracy and visibility. Tall sliding fences support crown molding up to 7-1/2″ nested and base molding up to 6-3/4″ vertically against the fence while easily sliding out of the way for bevel cuts. Adjustable stainless steel miter detent plate with 10 positive stops improves productivity and ensures cutting accuracy. Miters 60° to the right and 50° to the left providing increased capacity. Oversized bevel scale makes bevel angle adjustments accurate and easy. Compact, lightweight design (56 lbs.) allows for easy transport and storage. Innovative gearbox and belt-drive design increases vertical cutting capacity. The good stuff starts at about the 4 minute mark. You could adjust the best miter saw until you think it’s accurate, but until the blade hits the wood you have no idea exactly where it’s going to land. Now you will if you own a DEWALT DWS780, because it shines a bright LED light onto your surface material. It’s essentially a substitute for a laser, and it’s extremely reassuring when you’re using it. Are you curious as to why DEWALT have decided to opt for an LED light in their quest to design the best miter saw? With traditional lasers you have to recalibrate them when the alignment eventually gets messed up over time. The LED light doesn’t get affected over time or when you change the blade, so it will stay accurate forever. Exceptional quality engineered for professionals. The DEWALT DWS780 also comes with a 15-Amp motor, and even though it only hits around 3,800 RPM you won’t be able to notice the difference. This is important because if you’re a contractor this model would be a fine choice. It can handle large pieces of wood, and has built-in features like an exclusive back fence design and rail lock latch too. Another positive if you’re working with it in rugged environments is its durability. Every piece of the DEWALT DWS780 has been specifically designed to handle a lot of usage and occasional bumps. Even though it’s a solid piece of machinery it only weighs 56 pounds, so nobody is going to be too troubled moving it around. It’s also the first model we’ve looked at where you’ll be able to slide the blade back and forth over a 12-inch distance. The double bevel feature means your productivity will improve dramatically, and it’s also helped by the bevel having positive stops at certain points. In total it’s able to pivot 49 degrees in each direction. Click to see a large version of this diagram from the manual. When it comes to the miter angle range it’s also way ahead of the last model we looked at. The DEWALT DWS780 can move 60 degrees in one direction and 50 degrees in the other. The final thing you’ll be impressed by is the dust collection system, because it will capture up to 75 percent of all the dust generated while it’s in use. ** This model is now improved with the Hitachi C12RSH2. See more information below. ✓ View or download the MANUAL or the PARTS LIST for the Hitachi C12RSH. Now 54mm wider than the C12RSH. ✓ View or download the MANUAL or the PARTS LIST or the BROCHURE for the Hitachi C12RSH2. As you’ll see, the features of the new model are almost identical. Fixed rail slide design that eliminates the need for rear clearance to accommodate the extension of the sliding rails. The miter saw can be placed against a wall or situated in tight work areas without reducing cutting capacity. 630mm wide base : 54mm wider than the previous model C12RSH. Sliding sub-fence : High enough to support large work pieces for stable cutting . 59 lbs (27kg) in weight (without the cord) : 2kg lighter than the Hitachi C12RSH. Laser marker : Casts a line over the whole cutting width. The laser line can be shifted by turning the adjuster. Carbon brush access : Replace the brush whenever you want to — quickly. Dual bevel: (left/right 45°) Allows cuts in both directions. You don’t have to flip the piece over; speeding up your workflow. Positive stops for fast and straightforward miter angle setting. Laser marker system is highly accurate. Large sliding fence raises fence height to 5.125″ to cut up to 7.5″ crown molding vertically. 0-57° miter angle to the right and 0-45° to the left. 0-45° bevel angle range to the right and left allowing you to work efficiently. Vertical handle grip with comfortable vibration reducing elastomer. We recommend purchasing the Hitachi UU240R Fold and Roll Heavy-Duty Miter Saw Stand. This stand makes it easy to move your miter saw around. Ultra-portable for around your home or job site. Or, consider the simpler Hitachi UU240F stand with wheels. Released in 2016. Hitachi packs a lot of features into this saw. The C12RSH2 is similar to the C12RSH so it’s worth reading an overview as a frame of reference. This is a much more advanced Hitachi miter saw than the last one we looked at, because it’s joined the ranks of other models striving for accuracy. The C12RSH offers this with built-in laser technology. It allows you to see where you’re cutting before the blade is switched on, plus you can move it to either side of the cut mark manually too. Another big difference between this model and others in its category is the compact glide system, which you’ll use often if you take advantage of its sliding feature. Hitachi have somehow created a sliding compound miter saw that doesn’t need any clearance space. You’ll be able to move the blade back and forth even if the miter saw is sitting against a wall. The laser isn’t the only feature giving you complete accuracy. The C12RSH miter angle range is slightly less than the DEWALT model we looked at, because it will only turn 46 degrees to the left and 57 degrees to the right. But it might still be the best miter saw due to its micro-miter knob letting you adjust it to the most precise angles imaginable. Versatile miter saw stand works perfectly for your Hitachi saw. The dual bevel range sits at a respectable 45 degrees in each direction. We’ve already said the blade is 12-inches in diameter, and if that isn’t enough the pivoting fence can still lift up just over 4-inches to allow you to fit larger things like crown molding into the path of the blade when you’re cutting vertically. The weight of the miter saw isn’t too bad, and even though it’s just under 64 pounds it will be portable enough to move around if you need it for more than basic DIY projects. It’s easy to access the carbon brushes on this Hitachi miter saw too, which combines well with the collectible bag to increase the lifespan of your machine. If you’re worried about safety you’ll appreciate the fixed splinter guard, plus it also has Hitachi’s signature elastomer grip to reduce the vibrations you’ll feel when holding the handle as the blade spins at 3,800 RPM. You will feel at ease once you’ve purchased it thanks to the 5-year warrant Hitachi are proud to offer. Axial-Glide offers wider cross-cuts, enhanced alignment and smooth glide. Bosch also decided the GCM12SD shouldn’t take up too much room on your work bench even though it’s a gliding miter saw. Their solution to the problem was an axial-glide system, which they claim means you don’t need 12-inches of wasted space other models in the category require. Their powerful system doesn’t even use the traditional rail setup. Ergonomic ambidextrous trigger handle with soft grip. If your best miter saw has to include an excellent bevel angle range the Bosch GCM12SD will suit you. Even though it can only swing 47 degrees to the left or right, it’s still got a slightly bigger range than most miter saws. You also have the popular angles marked out to increase the speed you’re able to go at when working. The bevel angle scale is even highlighted as having high visibility in different conditions, so it’s an obvious giveaway it’s designed for more than carrying out small jobs in your garage. We know it’s powerful enough to handle hard woods and other materials, because the 15-Amp motor hits 3,800 RPM like so many we’ve reviewed so far. Have you ever wondered how many teeth the blades have on some of the best miter saws? There are 60 on the one you get with this machine, but it’s also compatible with a lot of various blades. The same can’t be said for every miter saw, which makes this one of the more versatile models. Unfortunately if you want to test them out they’ll need to be purchased separately. Once you grab the handle you’ll know what comfort feels like. It’s larger than your average one, plus it’s been built to be used easily no matter what hand you want to grab it with. We’ll look at a couple of more features designed to improve usability, but first let’s touch on one of the only bad things. At almost 90 pounds in weight it’s not exactly light. The clear guard covering the blade gives you an accurate view of where it’s touching down. Special quick-release fences help you set the miter angle very precisely, and they’re so easy to lock and unlock it only takes one touch. The final helpful feature is the dust chute, and this one also comes with a vacuum adapter to collect even more dust. Lightweight, portable and built to last. Powered by lithium-ion batteries. This battery-powered miter saw is an impressive piece of technology. Technology has come a long way in the past 5 years. If you want power and portability then this is the miter saw for you. It can get over 400 cuts on a single battery charge (based on cutting a 2×4). Two 18V LXT Lithium-Ion Batteries deliver the power and performance of a corded miter saw without leaving the 18V LXT platform. Miters 0-47° left and 0-57° right; bevels 0-45° left and 0-5° right. Positive miter stops at: 0°, 15°, 22.5°, 30° and 45° left and right. 4-Steel Rail Sliding System increases rigidity to produce superior cuts. Linear ball bearing system engineered to deliver “dead-on” accurate cuts. Soft start and electric brake. We talked about the battery-powered compound miter saw earlier on, and now we’re going to see if this one will live up to your expectations. If you thought the Makita XSL02Z would be less powerful you’ll be in for a shock. With the powerful brushless motor giving you a massive 5,700 RPM, it will cut through your material without any problems. Even a cordless miter saw can easily handle a big chunk of wood. This particular model has a cutting capacity of 2-inches by 12-inches when doing cross cuts and 2-inches by 8-inches when doing miter cuts at 45 degrees. It can’t handle the size of lumbar some other models will take care of, but it certainly comes close. Everyone knows if you want to produce quality cuts it’s absolutely essential your material is as rigid as possible, so Makita have tried to help this along by developing a 4-Steel Rail Sliding System. It gives it the rigidity it needs to give you flawless cuts even though the power of the machine would make you think otherwise. There are positive miter stops in all the right positions, and the angle range is 47 degrees to the left and 57 degrees to the right. The bevel angle range is questionable, but only because it teases you by pivoting slightly in one direction. It will tilt 45 degrees to the left, whereas it only tilts a meager 5 degrees to the right. Where the Makita XSL02Z really shines has to be its weight, because it sits at only 28.2 pounds when it doesn’t have any batteries. Even with a couple of 18V batteries attached it’s not particularly heavy, although you’ll likely prefer to keep one on charge at all times anyway. One will last a long time with the brushless motor extending its life 50 percent longer than normal. 4-Steel Rail Sliding System increases rigidity. Has a linear ball bearing system. Lots of other features await you, such as the electric brake which stops the blade as soon as you’ve made a cut. 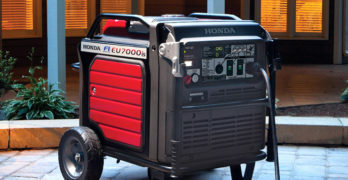 The Star Protection Computer Controls also keeps it safe from common battery-powered problems like over-heating and over-discharging. It’s comfortable to use all day because of the soft grip handle, although you’ll be forced to take a break eventually when your batteries die. 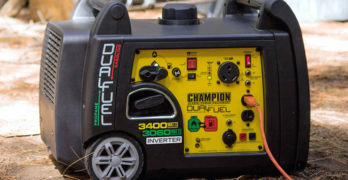 Consider buying extra 5.0 Ah batteries (BL1850B-2) as well as the Makita Dual-Port Optimum Charger (DC18RD) to eliminate downtime. It will recharge your 5.0 Ah batteries in 45 minutes. You can literally run this miter saw all day if you invest the extra money. This only makes sense if you need to work for long hours at a time. For most homeowners, the included battery will suffice. Extend your working time and ensure you finish your work. Charges two (2) 18V LXT Lithium-Ion 3.0 Ah (BL1830-2) batteries in 30 minutes. Charges two (2) 18V LXT Lithium-Ion 4.0 Ah (BL1840-2) batteries in 40 minutes. Charges two (2) 18V LXT Lithium-Ion 5.0 Ah (BL1850B-2) batteries in 45 minutes. Net Weight (with battery) : 28.9 lbs. Includes a durable carbide blade, blade wrench, and dust bag. 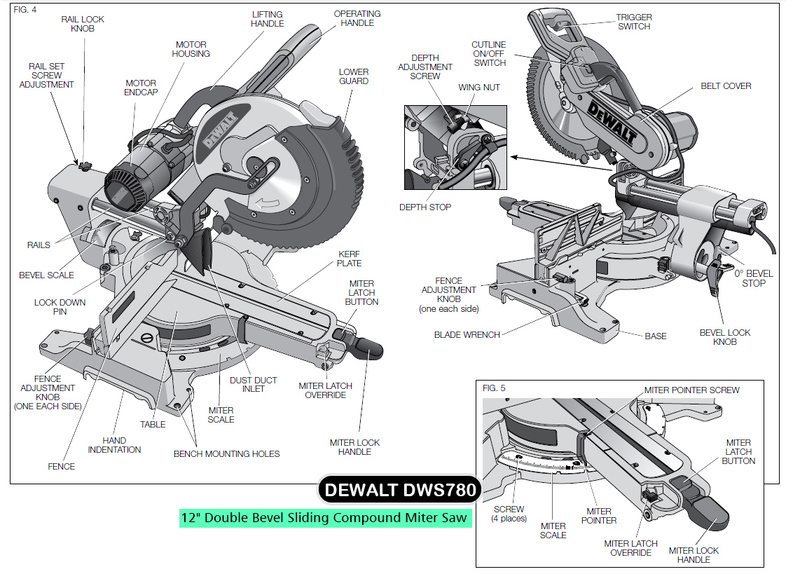 ✓ View or download the MANUAL for the DEWALT DW715 miter saw. If you don’t have any huge expectations the DEWALT DW715 could be the best miter saw for you. It falls somewhere in between the middle of the pack, so you’ll end up with a perfectly respectable compound miter saw for a very generous price. As you’ll have guessed by now, the reason for this is because it’s only a single bevel drop saw. When it comes to power the 15-Amp motor will generate up to 4,000 RPM, so it’s not exactly slacking when it’s time to cut wood. The cutting capacity is lower than we’ve seen before, and on the DW715 it can deliver cross cuts at 2-inches by 8-inches and 45 degree miter cuts at 2-inches by 6-inches. The 45 degree bevel cut capacity is 2-inches by 8-inches. Excellent engineering make this a great buy for professionals. It isn’t too bad when it comes to bevel cuts, because even though it will only drop one way it still reaches 48 degrees. Like all the other exceptional DEWALT miter saws, you’ll have a sliding fence when you’re working with crown and base moldings. Just remember it needs to be taken away before performing your bevel cuts. Due to its lack of a dual bevel system it would be bad if it didn’t do something special in the miter department. It turns out to be a match for some of the best miter saws. Your miter angle range will be 50 degrees in both directions, plus you’ll get an adjustable steel detent plate with a total of 11 positive stops. Not only is the DEWALT DW715 one of the lightest compound miter saws, but it also has another feature which is great for portability. Along with the low weight of 42 pounds, there is a carry handle built into the design to make sure it’s simple to pick up and carry around with you. It could be the best miter saw if you need a lightweight one for work. DEWALT are known for having a good guarantee for their power tools, and with each one we’ll look at today you’ll get a 3-year limited warranty. You will also be able to get it serviced completely free within the first year. To really make you feel comfortable about choosing them they give you a 90-day money back guarantee too. Precision and accuracy is a key focus of this miter saw. Learn more by visiting the DEWALT site. Tall sliding fences support crown molding up to 5-1/2″ nested and base molding up to 4-1/2″ vertically against the fence while easily sliding out of the way for bevel cuts. Adjustable stainless steel miter detent plate with 13 positive stops improves productivity and ensures cutting accuracy. Compact, lightweight design (51 lbs.) allows for easy transport and storage. Dual horizontal steel rails with linear ball bearings deliver an accurate, durable, and compact saw. Precise miter system and machined base fence support optimize durability and cutting accuracy. Three-year limited warranty and 90-day money-back guarantee. ✓ View or download the MANUAL for the DEWALT DWS709. 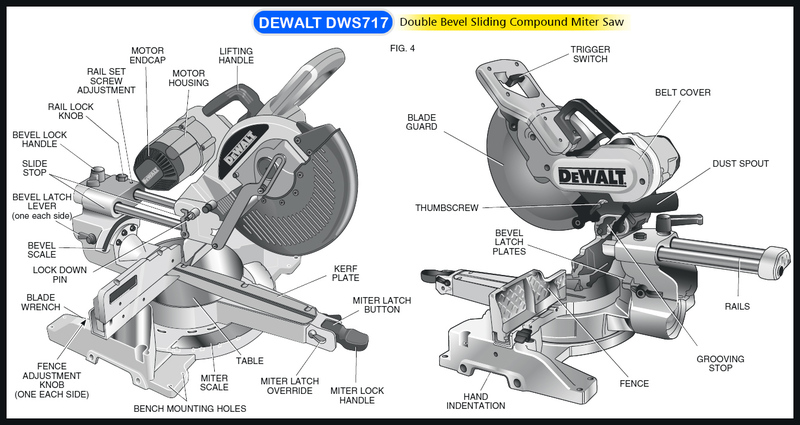 Do you know what the main difference is between the DEWALT DWS709 and the last model we looked at? They’re almost the exact same except for one thing. The DWS709 is slightly better in every single category except for the ones where all DEWALT models are the same. For example, it has 13 holes in the steel detent plate instead of 11. This one is a dual bevel model instead of a single bevel one, so it will speed up whatever job you’re working on. It also has a highlighted bevel scale to speed things up too, because it will let you adjust the blade to the right angle quicker. The highlighted scale feature also makes the drop saw a good choice when working it places like a construction site. We mentioned the adjustable steel plate with 13 positive stops to speed things up and ensure better accuracy, but we’ve not looked at how good the miter angle range actually is. It’s capable of moving 60 degrees to the right and 50 degrees to the left. The DWS709 is a sliding compound miter saw, so the blade will be able to move backwards and forwards too. All DEWALT models have a slightly different cutting capacity, which is good to look at to judge the size of material it will take care of. You should expect cross cuts of 2-inches by 14-inches thanks to the exclusive back fence design, and it will give you miter cuts of 2-inches by 10-inches at 45 degrees, both of which are big numbers. Finish your DIY projects with style and grace. We did say it wins in every category, but it should be crystal clear it will always be the loser in one. Due to all the features the DWS709 has to offer the weight has sneaked up to 51 pounds, but that is still considered very light and easily portable. It’s also a small enough size to be able to store if you are transporting it around. All of the DEWALT miter saws have tall sliding fences, but we’ve not really touched on them so far except to mention they exist. They’ll allow you to tackle crown molding up to 5.5-inches long when it’s nested and base molding up to 4.5-inches long when it’s sitting vertically against the fence, and they’re simple to slip out when it’s time for bevel cuts. Click to see an overview of all of the major components. Refer to the manual. Quick setup, easy to adjust, great design, & accurate controls. Exclusive bevel detent system with 7 positive stops delivers fast accurate repeatable cuts. Adjustable stainless steel miter detent plate with 11 positive stops improves productivity & ensures cutting accuracy. Machined-base fence support maintains fence perpendicularity with blade for cutting accuracy. Dual horizontal steel rails with innovative clamping mechanism and linear ball bearings deliver an accurate, durable, and compact saw. Exclusive cross-cut stop positions cutting head for maximum vertical cut capacity. Best in class cross cut-capacity 12″ at 45-degree angle using back-fence design. Tall sliding fence supports up to 6-inch base molding to the left of blade and up to 3-1/2″ to the right of the blade. Miter capacity left 60° and right 52° for greater versatility. Bevels 0-48° for increased cut capacity. Cam lock miter handle provides fast locking action of miter table. Horizontal handle improved ergonomics provides increased comfort. 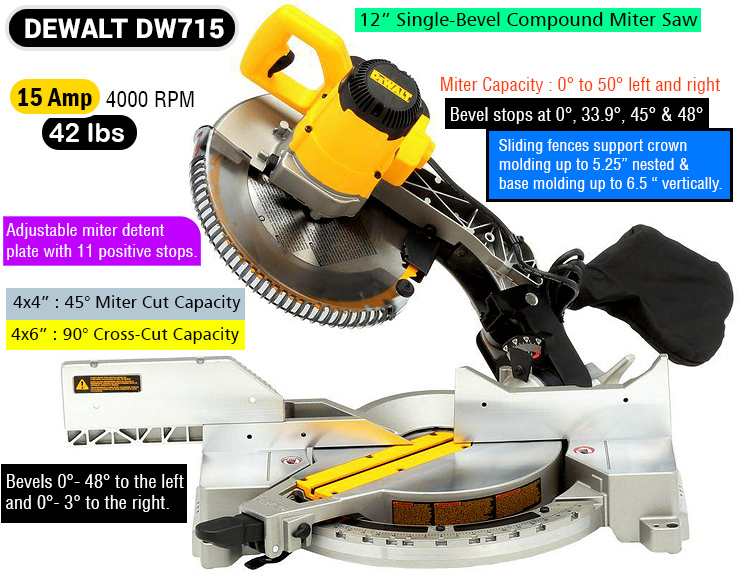 ✓ View or download the MANUAL for the DEWALT DW717 miter saw. Lastly, we have the amazing DEWALT DW717. It might look subpar when you spot it only comes with a 10-inch blade, but it’s another candidate for best miter saw you’ll be impressed by. For starters, the 15-Amp motor gives you a total of 4,000 RPM and equals the highest rating we’ve seen on a DEWALT miter saw so far. The tall fence supports 6-1/4-inch crown molding nested vertically. The previous model stated figures for cutting molding, which the DW717 easily surpasses. It can handle 6.25-inches of crown molding and 6-inches of base molding, and even though it might not sound significant to you just now there is a huge chance you’ll need to cut them if you’re a DIY practitioner or a contractor. Its dual bevel angles stretch to the extreme, because it will drop down all the way to 48 degrees on both sides. You’ll find 4 hardened stops on each side of the bevel too, so it will be as versatile as possible. The cam-lock miter handle is also easy to adjust to help you set your miter saw quickly when you’re working. Owning a sliding compound miter saw always comes in very handy in certain situations, but a lot of companies seem to mess up what’s a delicate part of the machine. DEWALT have got it right and it boils down to their dual horizontal steel rails. The linear ball bearings give it great accuracy and durability, plus the clamping mechanism is perfect. Please refer to the MANUAL for more detailed information. It’s surprisingly the exact same weight as the last model, and 51 pounds isn’t really heavy for a fully-loaded sliding compound miter saw. The same carry handle also makes an appearance, so it’s a good choice of miter saw for anyone planning on carrying it around. You’ll at least be able to lift it up onto the table accessory we’re going to look at next. In case the accuracy isn’t enough for you, there could be a solution to your problem. At the very beginning of the best miter saw reviews we talked about a laser being available for the Hitachi C10FCE2. The same kind of laser is also available for the DEWALT miter saws, with the only downside being the extra small cost involved. All of the miter saws in this article are 15 Amps so when using any 15 Amp power tool you have to make sure you use the correct gauge to maximize using the full rated power of your tool, and also to prevent overheating and potentially damaging the tool. To learn more read our in-depth guide to buying an outdoor extension cord. Heavy-Duty 12 Gauge extension cord. Every foot of cord increases the electrical resistance, in turn decreasing the power the cord can deliver. Therefore, the longer the cord, the larger the diameter of the conductors need be to minimize voltage drop (wire gauge numbers are smaller for larger diameter wire). Because of this, it is best to use a cord that’s exactly as long as needed and no more. Make sure you have the appropriate cord before using your power tools. Most homeowners think that all extension cords are the same but they are not. If you’re going to invest your money in buying a miter saw then make sure you also buy a quality extension cord. Any hardware store will carry what you need so there’s no excuse. Refer to your manual and follow the advice of the manufacturer. Life will be so much easier if you have a miter saw table. Think about all the trips you’ll have to make to the garage when you’re working on a DIY project if you don’t have one. They’re more or less essential if you’re moving your miter saw from site to site. They are easy to move around, you can attach any miter saw to them quickly, it’s possible to work at different heights, and some of them even let you adjust the wheels so your drop saw will be positioned perfectly on uneven terrain. You should already know if you’ll benefit from having one, but let’s take a look at a few of the best ones to help you make up your mind. Adapt to almost any miter saw or portable thickness planer. We’ve already looked at a lot of DEWALT miter saws today, but here they are back again impressing us with their rolling stand. It hits all 3 of the most important features anyone will be looking for. The large wheels offers you excellent portability, it’s easy to set up and break down, plus it can be raised to a few different heights to help with safety and comfort while using a miter saw. The DEWALT DWX726 stand raises and lowers pneumatically, so it won’t take any effort at all. Once it’s folded up you’re only looking at something measuring 59.5-inches by 17-inches, which means not only is it portable but easy to store away too. You’ll be able to throw your best miter saw onto it quickly, and when it’s set up it can handle 8-feet of material. Shipping Weight : 75 lbs. Tool Weight : 67 lbs. Universal mounting system allows for use with all major competitors’ saws. Integrated out feed and supports — Can handle up to 18-feet of material. Adjustable telescoping leveling legs — Perfect for uneven surfaces. Adjustable height out feed — up to 12-inches. Universal mounting system — Can be used with all miter saws. Integrated rubber wheels — Fast & easy to move around. The Bosch T4B might not look as aesthetic as the DEWALT DWX726, but it does have the top features you’ll be looking for. The 8-inch pneumatic wheels are so good they’ll be able to roll over any terrain you put in front of them. It also has its very own patented gravity rise system for setting it up and breaking it down. Its ability to lock your best miter saw into position is a thing of beauty. All you need is a quick turn of a release lever and a bit of downward pressure then your drop saw will suddenly lock into place. The support rails expand to handle 18-feet of material, but the coolest feature has to be the adjustable leveling feet designed to keep your miter saw flat on uneven surfaces. Material Capacity : 16 ft.
Best Miter Saw for You? You should know what the best miter saw is by now, but if you don’t the only real way to come to a decision is to read as many reviews as you can. To be honest, if any of the drop saws we’ve talked about today have caught your attention they’re unlikely to disappoint you. We’ve only looked at some of the best ones currently available on the market. There is one thing you can be sure of once your new toy arrives. Not only will it help you blast through any DIY project, but you’ll probably want to carry out a lot more throughout your home. In fact, after you’ve ordered your miter saw you should have a look around online to see the kinds of projects waiting for you. As you know, miter saws can be very dangerous if used incorrectly. Make sure you read your manual completely before using your new miter saw. In order to reinforce safety we recommend watching this safety video to ensure you are using your miter saw correctly. Sometimes people develop bad habits and forget about proper safety procedures. Safety should always be your priority when working.